LOS ANGELES — Veteran NBA guard Patrick Beverley was about to enter the Los Angeles Clippers’ locker room before he triumphantly yelled some choice words after defeating heralded rookie guard Lonzo Ball and the Los Angeles Lakers. “Weak a– m—–f—–. Bring him out on the court with me and I will tear his a–up,” Beverley said Thursday night after the Clippers’ 108-92 win over the Lakers in the season opener for both teams. Welcome to the NBA, Lonzo Ball. Ball has the brightest spotlight of any NBA rookie this season — or perhaps any NBA player, period. And that includes LeBron James, Kevin Durant, Stephen Curry and Russell Westbrook. A big part of it is that Ball has passing skills like Hall of Famer Magic Johnson, his Lakers boss. The former UCLA star is a local kid from Chino Hills, California, who became so popular that USA Today hired a writer to follow him around. He is the son of outspoken personality and Big Baller Brand CEO LaVar Ball. His family also has its own Facebook show. The star power on and off the court is so L.A. And that’s why the Lakers drafted him with the second overall pick last June. Ball’s rookie debut was the Lakers’ most anticipated game since Kobe Bryant’s retirement game at the end of the 2015-16 season. “It was great to start off with. But all I care about is winning,” Lonzo Ball said. With the Los Angeles Dodgers on the verge of making the World Series with a win over the Chicago Cubs on Thursday, Ball showed his support by arriving at Staples Center with a Dodgers jersey on about three hours before tipoff. The 6-foot-6, 190-pounder was later relaxing in the locker room behind closed doors with his teammates. Shortly afterward, a Lakers equipment manager began placing brand-new Lakers jerseys in each locker. The last jersey put in a locker was Ball’s No. 2. 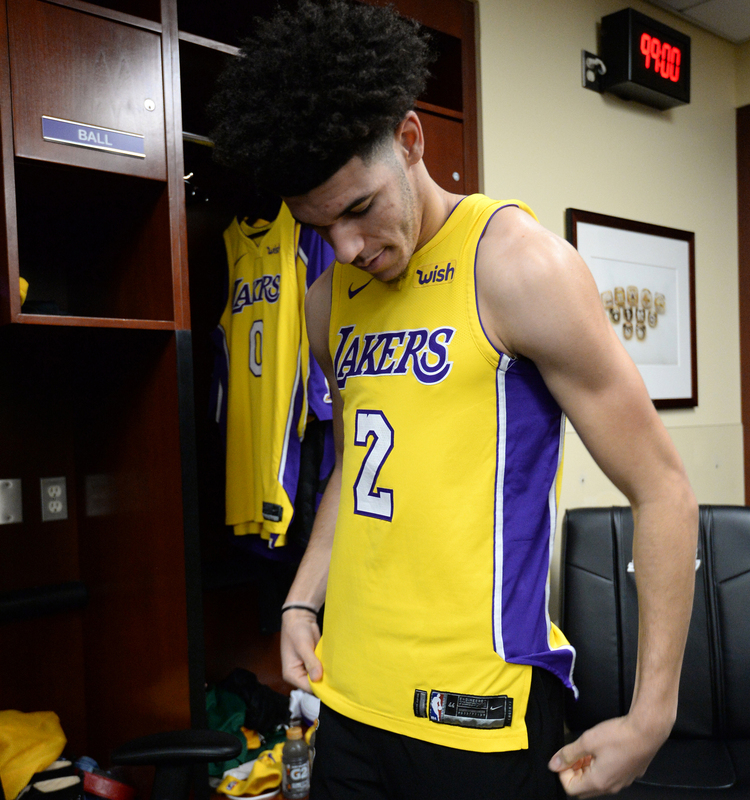 Lonzo Ball #2 of the Los Angeles Lakers puts on his uniform before the game against the LA Clippers on October 19, 2017 at STAPLES Center in Los Angeles, California. Through it all, somehow, Ball is unfazed and never gets too high or low. Even with nearly 19,000 fans in attendance, LaVar Ball makes his presence known with his personality and boisterous words that were often highlighted by numerous media outlets over the summer. Remember when he told a Fox Sports female reporter to “Stay in yo lane”? That is one of the merchandise slogans for Ball’s family-owned sports apparel company Big Baller Brand. Lonzo Ball wore some black Big Baller Brand shoes for his NBA debut and had his own film company following him around. About 40 of Ball’s friends and family members came to watch his NBA debut, including his parents. Lakers veteran center Brook Lopez addressed the crowd before the game. But when the Lakers’ starting lineup was introduced, the team went back to the Ball hype machine, announcing him last. That’s typical treatment for the best or most popular player on a team, i.e. James, Curry and John Wall. Watching proudly from the tunnel near the Lakers’ bench was team president Johnson. He attended the Lakers’ home opener rather than travel to Chicago to watch the Dodgers advance to the World Series for the first time since 1988. The Dodgers minority owner is excited about the baseball team, but his focus is on Lonzomania at the moment. Johnson was a heralded rookie in 1979 after leading Michigan State to a national championship over Larry Bird and Indiana State. Johnson, however, said Ball’s arrival to the Lakers was bigger than his in 1979. “It wasn’t even close to this,” Johnson said. “We didn’t have social media. We didn’t have sports talk shows like they do now. In terms of the hype and everything, we probably had the same feelings. And then I was known like he was known — you know, the whole high pick thing. And the NBA played it up like it’s being played up now. 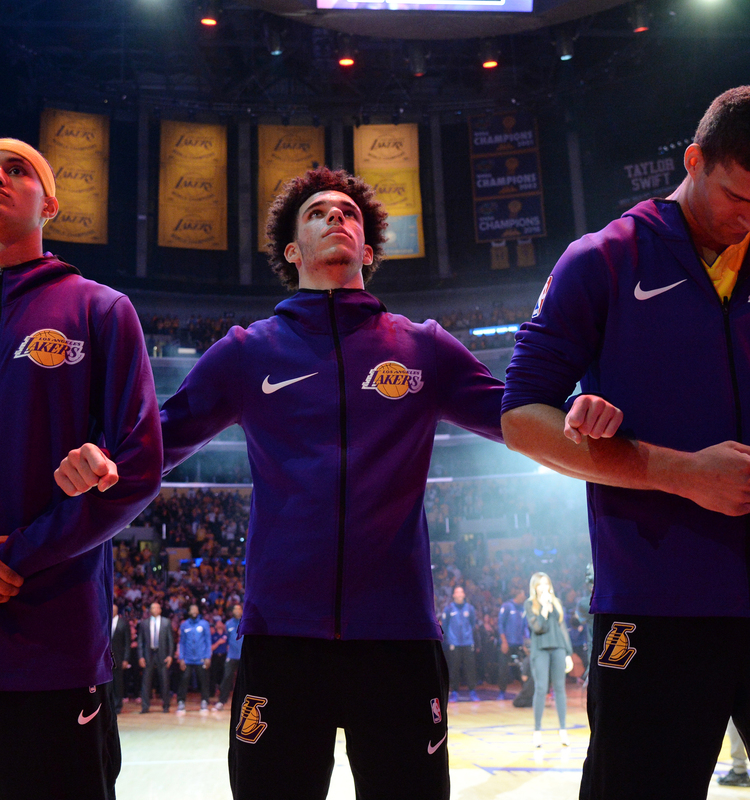 Lonzo Ball #2 of the Los Angeles Lakers with his teammates stand for the National Anthem before the game against the LA Clippers on October 19, 2017 at STAPLES Center in Los Angeles, California. There has been speculation that all the Ball hype and his father’s talking would put a bull’s-eye on the rookie’s back from the moment he played in a real NBA game. Lonzo Ball acknowledged the likelihood during Lakers media day. As expected, Beverley was physical with Ball from the start. The replacement for former Clippers star point guard Chris Paul even appeared to foul Ball hard once to set a tone. Ball missed 5 of 6 field goal attempts, made his lone shot on a 3-pointer, grabbed 9 rebounds, dished out 4 assists and had only 2 turnovers. Ball sat the entire fourth quarter, but the Lakers may have been resting him for Friday’s game against the host Phoenix Suns. On the 29 plays in which Beverley guarded Ball, ESPN Stats & Info tweeted that Ball missed both field goal attempts and three assist opportunities. Beverley told Ball that his motivation was his father’s mouth. 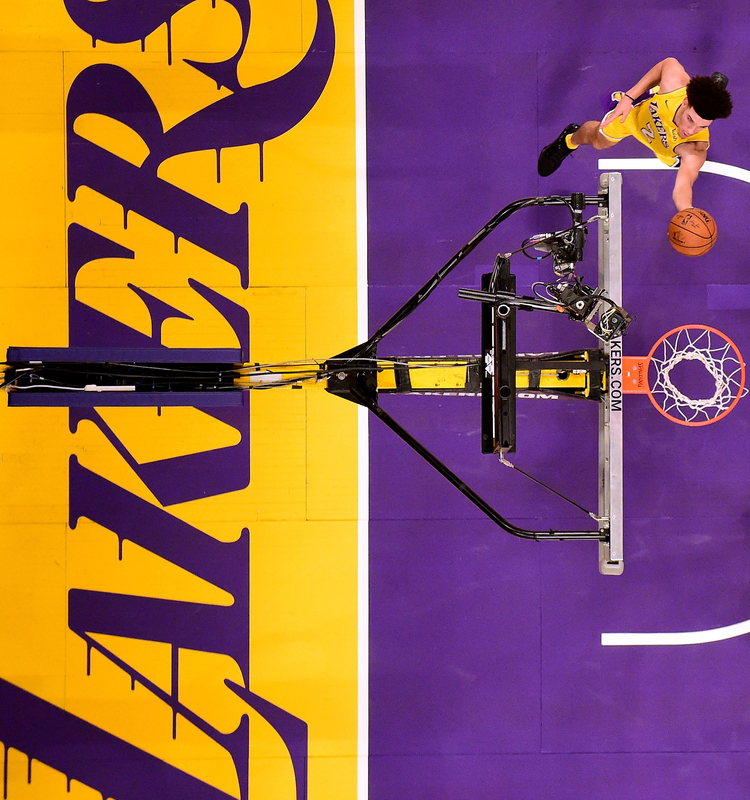 Lonzo Ball #2 of the Los Angeles Lakers attempts a layup during the Los Angeles Lakers home opener against the LA Clippers at Staples Center on October 19, 2017 in Los Angeles, California. After completing his media obligations, Ball went straight to the friends and family area where all his people were hanging out. He immediately went to his father, who did most of the talking in a respectable teaching way for about 10 minutes. Lonzo appeared to take in every word, and no one even considered butting in. Once LaVar Ball had finished his soliloquy with his son, he told the group of friends and family that it was time to depart. And they listened, leaving immediately while LaVar slowly departed as he talked to several media members and took pictures with fans. “It’s one game. It’s not special to me because I’m not finished with my task to get all three of my boys [Lonzo, LaMelo and LiAngelo] on the Lakers and in the NBA. They say, ‘You got to be excited. One of your boys made it.’ ‘Yeah, one, just one.’ Let’s say there is a riverbank and I take Lonzo and put him on [the other side]. Me and Lonzo good. The other two are in a raft. Before departing Staples Center after the first of what is expected to be many regular-season games, LaVar Ball was told the words that Beverley said about his son. A big smile instantly arrived on the father’s face. While Beverley was tough on his son during the game and verbally afterward, LaVar Ball had some loud words of his own in response. “Yeah, you shut the m—–f—– down,” LaVar Ball said to ESPN. “And your check still ain’t going to go no higher than what it is. Yeah, you shut him down. OK. Who is Patrick Beverley? He played all last year and nobody said nothing about him. Now we are looking at your first game. Why? Because Lonzo’s name is attached to it. LaVar Ball also accused Beverley of trying to make eye contact with him in the fourth quarter when he was sitting courtside near the Clippers’ bench. And this was just Game 1 for Lonzo Ball and family. “It’s a long season. I hate losing. I hate today, but I have to get right back at it today,” Lonzo Ball said.